My daughter, Poppy, is six years old. She loves Greek mythology. She’s Nova Scotia’s leading expert on Hercules and she loves Wonder Woman – an Amazonian princess created by Zeus. Poppy also loves Greek philosophy. But Socrates wasn’t always a philosopher. His father, Sophroniscus, was a stonemason and sculptor who helped to build a famous temple called the Parthenon, high up on a hill in Athens, in a place called the Acropolis. When he was a young boy, his father taught Socrates how to cut stone to make buildings and beautiful statues. That’s what he did for a living for many years and he became really good at it. Some people say he made a famous statue of three beautiful goddesses called The Three Graces, which stood at the entrance to the Acropolis. Socrates tried really hard to make his statues perfect. He wanted them to physically embody wisdom and virtue. He thought that would be the most beautiful and inspiring thing anyone could possibly create. He tried and tried but he was never happy with the results. He always felt something was missing. So he went to the older and more experienced sculptors, seeking their advice. He was disappointed, though. They made very beautiful statues depicting virtues like wisdom, justice, courage, and self-discipline However they couldn’t really explain what these qualities were or where to learn them. Socrates said they had become like blocks of stone themselves: blockheads, lacking wisdom and self-awareness. He realised they were looking too much at the outside, at statues, rather than looking deep inside themselves. They were experts at creating the appearance of virtue but they didn’t really embody it in their own lives. Then Socrates had a great idea. He did something that I’ve seen many therapy clients do over the years, and it often dramatically improves their lives… He quit his job. He put down his tools and from that day forward he stopped sculpting stone and began sculpting himself instead, his own mind, his character, trying to develop wisdom and virtue. He wanted to make himself beautiful rather than making beautiful statues. Everyone thought this was hilarious because Socrates was not very beautiful to look at. He had a big round belly and a snub-nose and his student Plato said he looked like a satyr, which is a cross between a man and a goat! [Actually, a man and a horse in ancient Greece.] It’s not a compliment. Socrates laughed back at them, though, and said that true beauty comes from within, from our character. He liked to say that if there was a beauty contest between him and the people laughing at him then he should be the winner because his character was much more beautiful than theirs. His friends weren’t convinced; they weren’t sure if he was joking or serious. Anyway he gave up being a sculptor and instead of doing his father’s job he decided to switch to doing his mother’s job instead. Now, Socrates’ mother was a midwife. But instead of helping pregnant women give birth to their babies… he wanted to become a midwife for wisdom… to help men and women alike to give birth to the ideas inside them, so that they could share them with other people, talk about them, and try to learn the truth about them. We call that “Socratic questioning”. 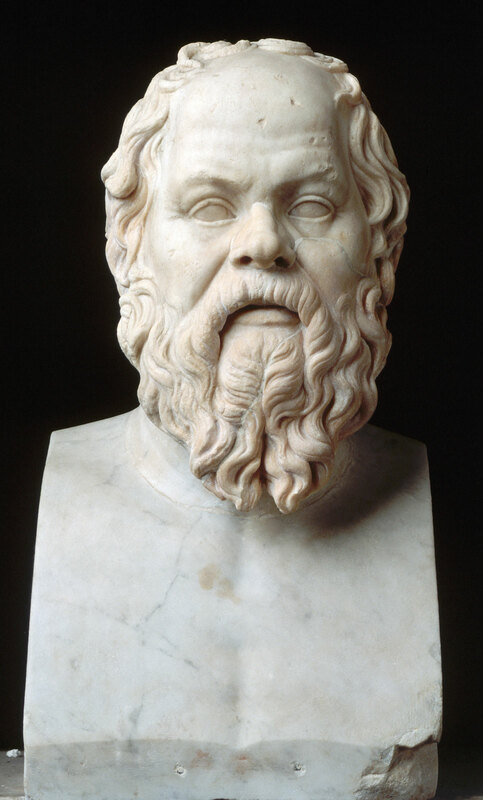 Socrates helped people to give birth to their ideas by asking them lots of really difficult questions about what it means to be wise and good. He asked soldiers “What does it really mean to be brave?”, he asked politicians “What is justice?”, and he asked teachers “What is the essence of wisdom?” He asked lots of questions but he always pretended he didn’t know the answers. That’s called Socratic irony – the word “irony” actually means feigned ignorance. He used to say “I know only that I know nothing”, pleading ignorance, although he was much wiser than the people to whom he was talking. If you ask Poppy, she’ll explain that’s the secret of Socrates’ wisdom. He used to ask lots of questions, and then he’d listen really carefully to the answers people gave. That’s how he became the wisest man in history. Once, Socrates asked his friends “what is justice?” and it led to a really long and really famous conversation, which was described in Plato’s book The Republic. One of Socrates’ companions said justice is helping your friends and harming your enemies. Even in ancient Greece that was a popular idea – it’s the worldview of Donald Trump and countless other politicians, good guys versus bad guys. It makes sense. Help your friends; harm your enemies… Socrates said that was wrong, though. He said justice consists in helping your friends and helping your enemies. Everyone thought he was crazy. So this was his argument… Wisdom is the most important thing in life. It’s much more valuable than material possessions. Why? Well, for example, wealth is only as good as the use we make of it. In the hands of a fool, money is used foolishly. In the hands of a wise man, money can be used wisely. So wealth is neither good nor bad in itself, what matters is the use we make of it. And to help someone is to do them good. So Socrates argued that if we really wanted to help people we would educate them and lead them toward wisdom rather than just giving them money, or other external things. And if our enemies genuinely become wise then they’ll cease to be our enemies and become our friends instead. So justice should consist in helping, or educating, both our friends and our enemies. Maybe that seems idealistic but I agree with Socrates. So this is my take home message… It may surprise you, but the main lesson I learned from Socrates was forgiveness. We blame people when we don’t understand them. To understand all is to forgive all. And so the closer we get to wisdom, I believe, the more forgiving we become. Socrates even forgave Anytus and Meletus the two men who had him executed. Indeed, he said something truly remarkable at his trial: “Anytus and Meletus can kill me but they cannot harm me.” That’s how firmly he believed that the most important thing in life is our moral character, the one thing that nobody can ever take away from you unless you let them. So I hope that now you all know as much about Socratic wisdom as Poppy does. An excerpt from the forthcoming book Teach yourself Stoicism (2013), about the exemplary “good death” of Socrates and its importance to Stoicism. Excerpt from Teach yourself Stoicism and the Art of Happiness (2013), copyright © Donald Robertson. In prison, awaiting execution, Socrates spent his final hours debating amiably with his friends about philosophy. Given the proximity of his own demise, he chose to explore the question of what happens to the soul after death, coolly examining several possibilities while keeping an open mind, tolerant of uncertainty. More importantly, he explains his view that philosophy is essentially a lifelong “meditation on death” (melete thanatou), as the reason for his surprising indifference. He says that those who practice philosophy in the right way are constantly training for death, and true philosophers fear dying least of all men (Phaedo, 67e). The “contemplation of death” therefore emerged right at the most dramatic moment in the birth of Western philosophy, spoken at the heart of what Socrates called his philosophical swansong. When the time came, he calmly drank the poison and waited to die, something he’d clearly reconciled himself to, and faced with supreme equanimity and an attitude of philosophical curiosity. Announcing The Philosophy of CBT (2010), now available online from Amazon and other retailers, and providing an update on reviews, etc. My new book, The Philosophy of Cognitive-Behavioural Therapy, came out in August, published by Karnac, the leading UK psychotherapy publisher. This is the first book to explore in detail the relationship between modern psychotherapy, especially REBT and CBT, and traditional Socratic philosophy, particularly Stoicism. According to Karnac’s website, it’s currently their most popular book on CBT. Amazon report it’s most popular among people who buy Prof. Paul Gilbert’s book The Compassionate Mind (2010) and Prof. William B. Irvine’s A Guide to the Good Life: The Ancient Art of Stoic Joy (2009). We’re pleased with how well it’s doing so far and have created this website/blog about it where you can watch a video interview and read excerpts from the book and reviews about it, as well as related articles. I hope you’ll enjoy the articles and consider delving into the book to find out more about how Socratic philosophy informs the theory and practice of modern psychotherapy.